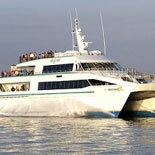 The Key West Express sails daily from the port of Fort Myers. It is a luxurious, state-of-the-art boat that comes equipped with all the necessary Floridian amenities. Relax and enjoy the scenic view from the sundeck. Enjoy a Pina Colada at the fully stocked bar. If the blazing Florida heat and humidity is too much for you, then you can relax in one of the climate-controlled cabins, flip on the satellite TV and marvel at the unprecedented speed in which you arrive your destination. The one-way service from Fort Myers to Key West ensures that your voyage through the beautiful waters of the Gulf of Mexico will be a pleasurable one. In Key West, culture and charm exist on every corner. It is a taste of the Caribbean without leaving the United States. If you are planning on going to Florida and find yourself in the Fort Myers area, then do not miss the chance to visit Key West.